If men age like fine wines, then I say women age like a fine French cheese. A little stinkier, a little moldier, sometimes a little uglier, but there forms a deep intense richness, and a certain complexity and sophistication that can't be found amongst immature little fromage-lings. 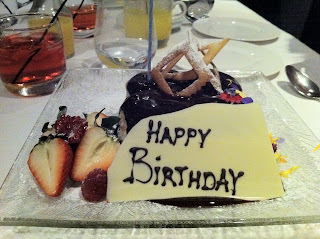 Pleasantly surprised at Otto Ristorante when a birthday cake was presented! I'll have to upload photos later on. You can catch em at Gastronommy's Facebook. Yan can, and you cannot.